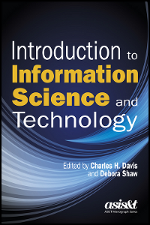 Introduction to Information Science and Technology, Edited by Charles H. Davis and Debora Shaw | Information Today, Inc.
"The editors have done a remarkable job of integrating the expertise of a wide range of interdisciplinary contributors to this collaboratively written, comprehensive introduction to information science and technology. The book is a model of clarity, systematization, and sensible conceptual and theoretical simplification that should make it an indispensable textbook for students and information professionals alike." This guide to information science and technology—the product of a unique scholarly collaboration—presents a clear, concise, and approachable account of the fundamental issues, with appropriate historical background and theoretical background. Topics covered include information needs, seeking, and use; representation and organization of information; computers and networks; structured information systems; information systems applications; users' perspectives in information systems; social informatics; communication using information technologies; information policy; and the information professions. "The result of a unique collaborative effort, this book should be equally valuable as a textbook and for self-study. It offers a readable overview of key topics, supplemented by a glossary and well-selected lists of references for further study." "Extremely well-written collaborative work by some of the current gurus of information science and technology! [This is an] easy-to-read text compiled from ongoing scholarly discourse that will enhance students' grasp of the extensive assortment of information science and technology concepts."